As I said I am not a John Connolly supporter which based on my reasoning also makes me not a supportive of the FBI because of this dastardly program which is known to exist by all the FBI agents. The tragic happening to John Connolly should be a warning to all FBI agents engaged in the program that they are playing with fire. For nothing John Connolly did (even assuming that those who testified against him were telling the truth which I do not believe for one minute but to tell this tragic story I must) was not part of what he was supposed to have done as an FBI agent. It was his job under the program to use both Bulger and Flemmi as informants and gain information from them so that the FBI could go after others. There is little doubt they provided him information. Its worth may be questioned by some but it is clear at a minimum that they gave him the interior setup of Gerry Angiulo’s Mafia headquarters so the FBI could plant a bug and aided them in their investigation of Vanessa’s in the Prudential Building and the recording of a Mafia induction ceremony. Each of these thrust a dagger into the Mafia’s attempt to survive. Some suggest that most of the critical information came from Steve Flemmi an Italian who was trusted by the Italian Mafia. This may be true. What is also true is that he would not have done it if his partner Whitey was not in on the deal with him. Whitey at his trial averred that he was not an informant. This would suggest Flemmi was and Whitey did not know it. Few give this any credence. They were always together when with Connolly. It is also belied by the fact Whitey met with the FBI Special Agent-in-Charge when the SAC planned to terminate Whitey’s services as an informant. Whitey made a pitch to justify his being continued on as a TEI. If then it was part of his job to handle these top criminals then why do I not support him? It is I believe one cannot escape responsibility for one’s individual actions by saying I was only doing my duty or what I was told. The idea that anyone in law enforcement would have a relationship with and protect two persons known to be top violent criminals engaged in murdering people is something I cannot accept. As an aside, it is also why I can never respect those law enforcement officers working with the federal prosecutor who sat in court during John Connolly’s trial and laughed in support of John Martorano’s attempt to crack jokes while testifying. Martorano murdered more than 20 people and these officers had become his buddies. Also, the prosecutor Fred Wyshak who, during his direct examination of Steve Flemmi laughed along with Flemmi when talking about the killing of Brian Halloran. Halloran was murdered by Whitey. Both seemed to find humor in his nickname “balloon head.” Their joint mirth suggested a closer band between them than appropriate when you here more about Flemmi..
A simple look at the matter shows that the matters surrounding John Connolly involved a field of sordidness. Why then do I write about it? I believe John Connolly is as much of a victim of injustice as Alfred Dreyfus the Jewish French captain unjustly convicted by French military courts of treason. Unfortunately for Connolly there is no one of prominence like Emile Zola who is interested in writing a “J’accuse” paper on his behalf as Zola did for Dreyfus. Nor is there the stink of anti-Semitism. No religious beliefs are implicit in Connolly’s injustice but certainly his close political connection played a role in his mistreatment. To return to the nub of the matter the FBI has a program that favors some vicious criminals over the others which is designed is to ensure their favored vicious criminals (TEIs) remain free to commit crimes while providing information against others. It assigns agents to work in this program. By what right can it allowed one of its agents to be prosecuted for doing what it required him to do? To all of Matt Connolly’s bloggers: Bill C., NC, David Fishwick, John King McDonald, Declan McManus, and others. I have been away from the computer keyboard and just finished reading all of the many comments written about the FBI, John Connolly, DEEP State [whatever that means] and the TE [Top Echelon Informant Program]. I would like to make a few comments relative to the security of the USA: First of all, we need informants, period. Every law enforcement needs informants to assist in solving crimes, that means, law enforcement needs to target “Bad Guys,” not “Bible Salesmen.” As repulsive as some of you feel about “informants,” the reality is Law Enforcement depends on “Bad Guys.” Law Enforcement targets “murders, robbers, drug dealers, etc., to get information on other “Bad Guys.” These criminal targets, are known to be murders, etc., however, the inescapable fact is Law Enforcement has no proof that the informant targeted has actually committed any of the rumored and/or alleged crimes running rampant in the neighborhood. Tales, Anecdotes or stories circulating within the community are unverifiable; if they were, and evidence was developed to charge a potential target, the respective law enforcement would proceed and prosecute. Second Point: As I mentioned before, after a target is developed, debriefed and approved to be included into the TE -Program, a memorandum [or memoranda] is/are prepared outlining the targets value. This memorandum is sent to the DOJ in Washington, DC, SOG [ Seat of Government] where a decision is made as to the targets suitability for inclusion into the TE-Program. The TE target is then reminded [my word] that he/she is not allowed to kill ANYONE, PERIOD! After the targeted TE is accepted into the program, a review of the do’s and don’ts are reviewed with him. The target is also allowed to continue with his criminal activities so as his criminal associates will not be alerted that something is amiss. The CIA, DEA, ATF, Homeland Security, USSS, and various military investigative units all need informants. They solicit every walk of life to report on the adversaries trying to harm the US of America. They could care less if they are murders, etc. It’s a nasty world out there! So, do not be so naïve, accept the fact that “Bad Guys are targeted to get other “Bad Guys.” It has been that way forever! One last opinion: when you send your son/daughter out into the world, you trust that they will do the right thing; you have no way of knowing if they will. These are the same circumstances associated with informants. There is an unwritten rule: “Don’t ask, Don’t tell.” I will comment later once I finish reading the last blog by Matt Connolly. You cited all the reasons why we need a Death Squad like the FBI. Today’s word in the John Connolly’s neighborhood is misdirection. one goal and that is maintaing the deep state. See Peter Dale Scott to help you define deep state. voter and taxpayer while it carries out it’s real work as a Death Squad. Presidents and Activists that threaten the Deep State. Boston Marathon bombing, 911, the Murragh building bombing,etc. Congress, the Supreme Court, the media etc. assassinating President Kennedy and Martin Luther King. while in reality it is used as a maintenance tool for the Deep State. Center and collapsed the buildings. in a controlled demolition to collapse the twin towers. explosive weapons for the US Air Force his entire life. to do any damage to reenforced concrete of building. rebar pushed from the inside outward. interests of the Deep State and are manufacturing consent. Reality is a tough thing to deal with for some people. Deep State: I thought it was the FBI, our military, our intelligence agencies, etc,. the organizations we depend on to keep America as a free state. Take thme away and what have you got, zippity, zippity, doo –> anarchy or nuts like Bernie Sanders (and Trump) running our country into the ground. I happen to like the FBi and think it has done a great job for America except here and there. One of the theres is the TEI program. Mostly it is a force for the good. The machine gun claim, the four innocent mafia guys framed and Connolly corrupt is total nonsense. It is the Duke lacrosse case and the Russian collusion case over again. Media fantasies for the congenitally naive. Live in the world you want to ; congenitally or any other way . This is the problem with lip . Your naivete regarding John Connolly was categorized by me as ” disappointed idealism . ” Clearly it was naivete or just outright denial. Yep, Johnny is an angel . FBI Angel John Connolly . Get your head out of the clouds. You’ve never put it together , have you . Why , of the million different examples Kevin Weeks could have conjured up about FBI Agents living in the Real World of James Bulger and lieutenants ,did he produce such a highly specific reference as : four FBI Agents toting machine guns ? As to twenty of Boston’s Finest , for indeed they are , being involved in any way with James Bulger . Why you would have to be one of the Princes Of The City OZ to ever suspect such . These guys do not live in a world of sentimental fantasy . I am not going to connect the dots for you . Try to figure out why guys would know at the time just who was calling the shots . No need to name names . Kevin did not . You’re right NC..Anyone that believes the BS about the agents with machine guns at his beck and call also believes in the Easter Bunny and Santa Clause. No , it was by no means a sham . There was a culture of complicity . Read some of msfreehs material on how easily the boundary between good and bad guys morphs from sharply delineated to the cloudy zone . If you really believe John Connolly did not have his much vaunted French cuffed shirtsleeves up when he was toiling in the FBI TEI vineyard then you have blinders on . The point is though that he knew how the wine was made . His bibulous Supervisor , John Morris , knew how the grapes were pressed . There were a lot of wine connoisseurs in the drawing rooms at the FBI . This is the essence of NOBLE CAUSE CORRUPTION . When Kevin Weeks said that James Bulger could call on G-men with Tommy Guns he spoke true . For a character study research FBI Agent McDonald , circa late sixties , in Boston. John got a raw deal . Period . 1.The deal was “no violence.” Flemmi’s a stone cold liar. 2. Matt, you continue to write as if John Connolly knew TEIs were continuing to murder!!! While John was handling Bulger and Flemmi, if he knew they murdered someone he’d arrest them. If the DOJ “knew” they’d murdered someone, they’d indict them. 3. You also ignore the fact that when Fed-State cops first issued indictments against Bulger-Flemmi etc, as late as 1995, those indictments contained zero murder charges. So no official in 1995 “knew” they murdered people. If DAs “knew”, who did they share that info with, why didn’t they indict? DAs didn’t know. You’re imputing knowledge to the FBI that the State and Locals didn’t have! You’re imputing knowledge to a front line soldier, that the generals lacked. 4. 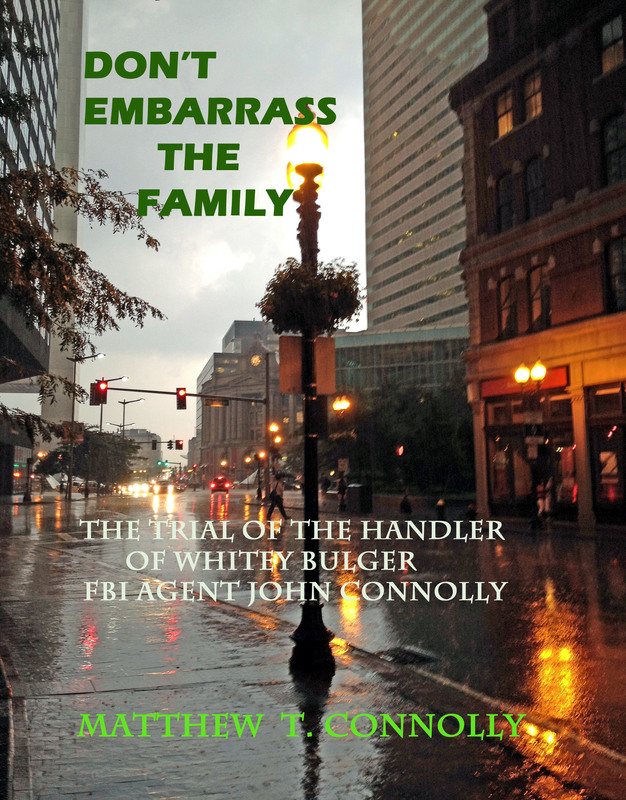 Neither you nor anyone else “knew” Bulger and Flemmi were “murdering” people in 1995 (five years after John Connolly retired.) But John Connolly in the 1980s and on the lowest rung of the FBI ladder was suppose to know that? How? Through ESP? 5. If any officials “knew”, they were duty bound to indict. None did till @1999. 6. But I guess your come back would be “never deal with criminals ‘suspected’ of being involved in killing”. So, all those heroin dealers, the Feds, States and Locals use as informers and cut deals with . . . . what about them? Everyone in law enforcement guilty? Or only John Connolly? Come on! 7. The FBI’s TEI program got 40-50 top Mafiosa. We’ve argued all those points ad nauseum. Just remember: At John Connolly’s Federal Trial in Boston, according to the Boston Globe, he was “acquitted of all the serious charges” and convicted of only 4 or 5 minor charges, only one of which occurred during his 23 years as an FBI agent. His one conviction: handing a case of wine to his boss John Morris. Morris said the case had an envelope in it with $1,000 cash. In Boston, Morris said the envelope was between the separators; in Miami, he said it was “at the bottom” of the case. ONE CONVICTION DURING HIS 23 YEAR FBI CAREER: GIVING A CASE OF WINE (with $1,000) TO HIS BOSS. One conviction in Boston during his 23 year FBI career! The minor charges (writing a letter to a judge in 1999; telling Weeks an indictment was coming down, etc.) Remember, the liar Weeks also said Bulger had 5 machine-gun toting FBI agents at his beck and call and 20 Boston cops on the payroll. Asked to remember a cop’s name, Weeks invented one! McClaughlin, or something. It was checked out. A total fabrication! Why did Weeks invent the “indictment” story, because Wyshak needed a 1995 act to avoid the Statute of Limitations running on 1980s charges. FROM START TO FINISH THE PROSECUTION OF JOHN CONNOLLY WAS A SHAM! Knowing someone is murdering others and having the proof to prove it is two separate things. John Connolly said the FBI put him out to handle murderers. I never suggested it was his job to investigate what the guys were doing. He would be disinclined to do that because of his relationship with them. I’m suggesting he never should have accepted the job of protecting guys he knew were murderers nor should the FBI have had such a program. What he was doing for them is protecting them. When FBI Tulsa wanted info on them he deep sixed the requests. That was his job – that’s what the FBI wanted – he was to protect them. The FBI required that anyone who had something on them to tell Connolly about them. Why? 3. I’m not imputing knowledge to anyone. I’m saying you should not team up with murderers and protect them. I agree until Martorano flipped in 1997 or 1998 no one knew about those murders. 5. See # 3 – plus knowing and having sufficient evidence to rove beyond a reasonable doubt are two different things. 6. No – you miss the point. You get a job handling murderers who you admit you know are murderers and your job is to protect them. Are you supposed to think that while you are protecting them they won’t continue to murder people. 7. So, what if the TEI program got 1000 Mafia guys. How many people did the TEIs murder while the FBI was protecting them. Is it all right that the TEIs to murdered people to convict Mafia guys? 8. Obviously Weeks invented the Walk-In Ice Chest story which allowed the RICO charge to be brought. He said he remembered it because it was a clear cold day; it was a warm windy day whith trees falling downin Quincy – the type of day you would remember if something like that occurred. Plus, you’d have to think Connolly a complete idiot to believe what Weeks said he told him. Thanks for answering my recent questions in your recent articles Matt and your newest article was well written and it made me think more about Connolly’s case. Do you think that the FBI should stop the Top Echelon Informant Program? Was Flemmi an associate of Jackie Salemme and Frank, Jr? What is your understanding of the investigation and bugging of Vanessa? Absolutely it should stop it. Remember after it was disclosed Rossetti was a TEI even Rep Lynch was shocked to find out the TEI program was still in existence sine he figured it terminated after it was disclosed Whitey and Flemmi were in it. You just can’t protect people who are known murderers and expect they will stop murdering people now that you are protecting them. It would seem they would become more brazen knowing the FBI is protecting them. Flemmi was very close with Frankie Salemme. Whitey complained about it. Bill McDermott a Brookline detective took pictures of Flemmi and Salemme frequently together in Brookline. I ssume through his long term association with Salemme he was close to the brother and the son. He tells how he walked into the house while Frankie and his son (I believe) were murdering someone. Vanessa was a ver successful fBI investigation helped by Flemmi which they were albe to wipe out the Mafia guys who were planning to take over after Gerry Angiulo went to the can. It was a deli in the Prudential Center and they met in the back room where a bug was successfully installed.